1. Disconnect the hood lock cable from the hood lock, and clip it from the radiator core upper support and hood ledge. 2. Remove the mounting screws, and remove the hood opener. 3. 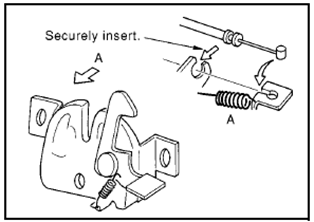 Remove the grommet on the instrument panel, and pull the hood lock cable toward the passenger compartment. CAUTION: While pulling, be careful not to damage (peeling) the outside of the hood lock cable. 1. Pull the hood lock cable through the panel hole to the engine compartment. Be careful not to bend the cable too much, keeping the radius 100 mm (3.94 in) or more. 2. Check that the cable is not offset from the positioning grommet, and push the grommet into the panel hole securely. 3. Apply the sealant to the grommet (at * mark) properly. 4. Install the cable securely to the lock. 5. After installing, check the hood lock adjustment and hood opener operation. 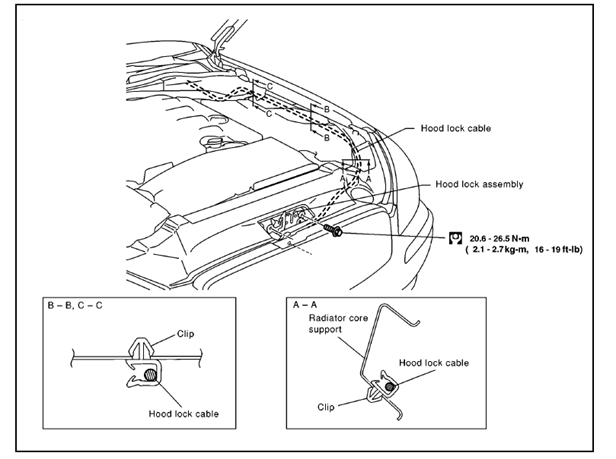 CAUTION: If the hood lock cable is bent or deformed, replace it. 1. 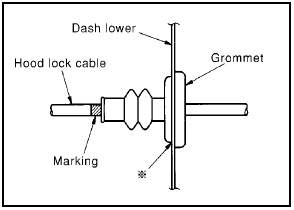 Check that the secondary latch is properly engaged with the secondary striker with hood’s own weight by dropping it from approx. 200 mm (7.87 in) height. 2. 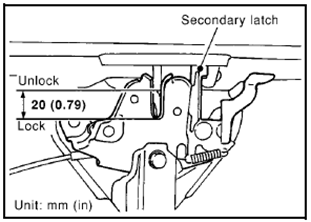 While operating the hood opener, carefully check that the front end of the hood is raised by approx. 20 mm (0.79 in). Also check that the hood opener returns to the original position. 3. Check the hood lock lubrication condition. 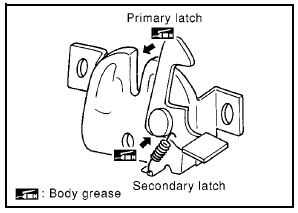 If necessary, apply "body grease" to the points shown in the figure.